Will the Real Craig Cole Please Stand Up? 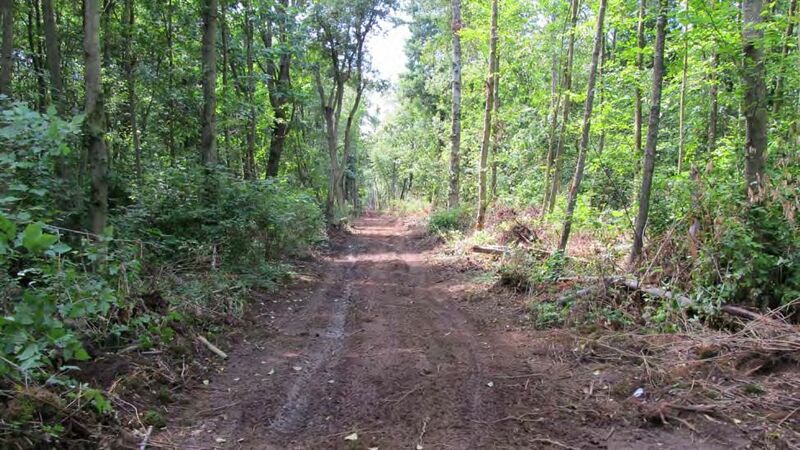 Unauthorized land clearing at Cherry Point by SSA/PIT’s engineering consultant. Photo is from Whatcom County PDS website. Considering the subject matter and timing of Cole’s opinion piece readers must assume it is in response to the August 11, 2014 Herald Op-Ed, “2014 totem pole journey honors tribes’ stewardship of land, water,” authored by Jewell James, who is a Lummi Nation tribal elder and is with the Lummi Sovereignty and Treaty Protection Office. Craig Cole never mentions either the title or the author of the “guest commentary” he refers to in his piece. Jewell James never makes this claim in his commentary. 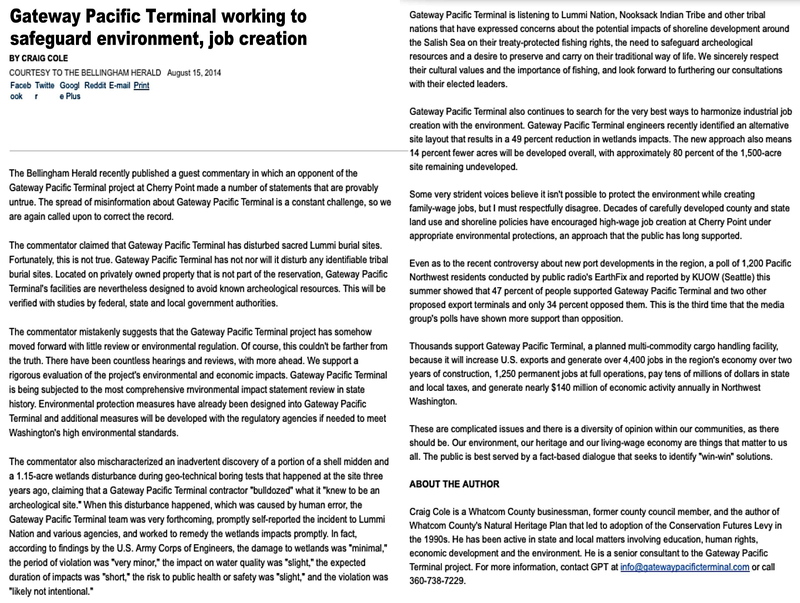 Neither does James suggest “that the Gateway Pacific Terminal project has somehow moved forward with little review or environmental regulation,” as Cole alleges “the commentator mistakenly suggests,” in his next effort to supposedly set the record straight. Twice here, respected Lummi elder James is being accused of having made “statements that were provably untrue,” that he never even made. In July 2011, without obtaining the necessary permits, SSA Marine/PIT bulldozed/cleared 9 acres, drilled 19 boreholes (from 80 ft. to 130 ft. deep), performed 19 cone penetration tests (100 ft. deep), destroyed close to 3 acres of wetlands, and illegally filled approximately 1.2 acres of wetlands at the Cherry Point proposed GPT site. Graphic displaying selected text from Washington State DOE, September 23, 2011 letter to PIT. The Washington Department of Ecology said in its September 2011 letter to PIT that the work done was in violation of state law. According to section 5.5 in PIT’s Project Information Document (PID) submitted to the U.S. Army Corps of Engineers (USACE) in February 2011, PIT knew the exact location of site 45WH1, the first documented archaeological site in Whatcom County, and said that “no direct impacts to site 45WH1 are anticipated as the project has been designed to avoid impacts within the site boundaries.” The PID also stated that PIT would have an archaeologist on hand for any work done within 200 feet of site 45WH1, acknowledged the need for an “inadvertent discovery plan” in case human remains or other artifacts were uncovered, and would be required to consult with the Lummi Nation under section 106 of the NHPA. Whatcom County Councilman Carl Weimer was out in the Cherry Point area with his dog the week of July 15, 2011 and discovered the unauthorized clearing by SSA Marine/PIT, which he then reported. According to a settlement communication sent by SSA Marine/PIT’s attorney to RE Sources’ attorney, Randel Perry of the USACE sent a July 18, 2011 email to AMEC saying a complaint about the unauthorized work had been received by his agency. A Whatcom County representative also called AMEC on July 18, 2011, alerting them to the complaint. The boring work was not halted until three days later on July 21, 2011. In his opinion piece, Cole depersonalizes Jewell James as merely “a commentator” or an “opponent of the Gateway Pacific Terminal.” In contrast, Cole personifies the GPT project a number of times, remarking at one point, ”Gateway Pacific Terminal is listening to Lummi Nation, Nooksack Indian Tribe and other tribal nations that have expressed concerns about the potential impacts from GPT on their treaty-protected fishing rights, the need to safeguard archaeological resources and a desire to preserve and carry on their traditional way of life.” Cole says this directly following a paragraph in which he minimizes the archaeological and environmental impacts resulting from SSA Marine/PIT’s unauthorized and unlawful actions at Cherry Point. In Cole’s bio under his Op-Ed, it states he “is the author of Whatcom County’s Natural Heritage Plan that led to adoption of the Conservation Futures Levy in the 1990s.” A November 2010 NWCitizen article gives a brief history of Cole having been the chair of a task force charged with exploring strategies for the preservation of our natural heritage. Cover page illustration from “‘Preserving a Way of Life’: A Natural Heritage Plan for Whatcom County” report. Twenty-four years ago, Craig Cole worked to preserve natural heritage and a way of life for Whatcom County, yet now he does not stand with the Lummi Nation, as they fight to protect and preserve the natural and cultural heritage of Xwe’chi’eXen (Cherry Point), and their schelangen, or Lummi way of life. Instead, Cole has chosen to work on behalf of PIT and its GPT project, a 48 million ton coal export facility, which stands to devastate the natural and cultural heritage of the Lummi Nation, and the sacred waters and lands of Xwe’chi’eXen. The title of Ms. Robson’s post poses the broad spectrum question of every citizen’s ability, indeed desire, to trust that the spoken word of “men” will match their actions. For if we see another man’s reflection in our eyes, what harm can we do him. We must tread lightly in our irrevocable decisions, for Washington state’s health impacts the entire world. If we exchange facts and opinions openly and without judgment, we can come to progressive solutions that will benefit WA, and mankind, in the long term. The Lummi’s simple, elegant culture must be cherished, for their regard for the land improves all mankind. Sandy – I have a weird feeling about Cole’s August 15th column that he was responding to Tim Ballew’s letter concerning the Gateway Pacific Terminal project, dated August 6, 2014, where Tim does remark about the illegal action in July 2011 and the unprecedented threats to Pacific Northwest Tribes. I believe the Lummi made this letter public very quickly and I am sure GPT and Craig Cole would have been made aware of it since it directly criticized the revised proposal that they submitted, saying that “[the changes they proposed] are beside the point and outside the larger truth.” Well, my comment to Cole’s column of August 15th did ask for him or the Herald to clarify who he was responding to and I do not believe anyone ever answered. Although everyone has assumed that Craig’s column was about Jewell James August 11th column, I never believed it was. We need it to be clarified. Richard Jehn: thanks for your comment. I remember reading your comment you posted under the online Herald Op-Ed written by Jewell James published on August 11. In your comment you pointed out that either Cole or the Herald should clarify who he was responding to. I share your sentiment on that. I can understand that you think Cole might have possibly been responding to LIBC Chairman Tim Ballew’s Aug. 6, 2014 statement/letter that was read by Freddy Lane at the Aug. 17 Lummi Nation totem pole journey blessing ceremony, because there are excerpts from Tim Ballew’s statement which also appear in Jewell James’ Op-Ed in the Herald. Because only Jewell James has had a commentary/opinion piece published recently in the Herald, and I do not see any commentary/opinion piece recently in the Herald authored by Tim Ballew, I’m pretty confident that Cole was indeed responding to Jewell James’ Op-Ed. The point you make is good though Richard, that either Cole or the Herald should have clarified that for readers for Cole’s Op-Ed. Thanks for checking out my article. Thanks COALSTOP and Sandy for this careful analysis and fact based rebuttal of Craig Cole’s letter. I think it is important for there to be a site where facts are checked and Coalstop does this here with Sandy’s article. GPT proponents’ deep pockets seem to me to have influenced and perhaps intimidated some sources into restricting their coverage of information opposing GPT. It is expected that the proponents will try to paint a (deceptively) rosy picture of GPT but deliberately false and misleading statements need to be called out as such for the record; so thanks COALSTOP and Sandy for this important site and it’s information. Notice how their projections to 2060 are based on conservative estimates that have since been upgraded. Current IPCC estimates to 2100 range from 1.1-2.9 C in their most conservative scenario (there are six scenarios0, to 2.4-6.4 C in the most dire scenario. It is well-known that ALL IPCC calculations consistently underestimate real world changes. The upshot is that the 2010 paper is too conservative AND current IPCC estimates are too conservatives. In other words, we are in deeper doo-doo than we realize. What the GPT would do is contribute significantly to cumulative emissions. If the GPT is stopped, it is not a given that the Wyoming coal will still go to China. The coal industry is already in a steep downturn due to market forces and Craig Cole and company know this. Their relentless push for a coal terminal in Whatcom County has other motives. The most likely motive is just quick profits and the environment be damned. It actually brings up a lot of emotion in me to read over the 1991 Natural Heritage Plan report that Craig Cole is listed in as Chair of the task-force. To have at one time come together with other invested county members with vision and purpose for such a critical cause and to present a report that offered such promise, direction, and impetus for preserving and protecting our locally prized natural environment, seems to me at direct odds with the avid promotion of a mega coal terminal piled with toxic product and the dangerous industrial instruments that it would take to run it. The natural environment at Cherry Point is going to be destroyed by GPT, it’s just a matter of how much of it. The Mister/Ms Important Cool — whoops, I meant Coal — is for the Indian; No s/he is against the Indians; No s/he is being paid by GPT and s/he says whatever s/he can get away with so that the uninformed voting citizens will believe him/er. S/He is a lawyer, remember, and knows his/her job is to convince people of whatever the Coal industry wants him/er to. And uninformed people prefer to read short explanations that claim allegiance to the good indian and good jobs. Such a person is not convincing Indians, s/he is convincing the working public that has little time to read and/or verify claims. Thank you Sandy for exposing lack of truth. Some people may use the word “lies” when referring to Cool but I don’t want to get into trouble like you did even though you did not say s/he lied. You just scared the weak. Many lawyers have a bad name because they lie in order to manipulate the jury. We citizen’s are Cole’s jury and subject to his verbal tricks. Sandra, the more you expose the more likely you will help save this endangered world. Sandy, while Craig Cole chaired the 1991 ’Preserving a Way of Life’: A Natural Heritage Plan for Whatcom County.’ report, less than a decade earlier he was on the County Council as an enthusiastic supporter of Chicago Bridge and Iron’s (later Kiewit’s) proposal to build large oil derricks on the beach at Cherry Point, and then drag them over the fragile tidal ecosystem to be floated off to at-sea drilling operation around the globe. As now, labor was an enthusiastic supporter, as was the Chamber. It was oly thanks to Governor John Spellman (R) who vetoed the measure that the habitat was preserved. So I don’t think Cole’s perspective has changed as much as perhaps some think. Here are a few dates and events from that timeline which relate to the excellent points you brought up. You probably are familiar with these, but I was not familiar with most of them and possibly others may not know as well. 1977 – Chicago Bridge and Iron proposes building offshore oil drilling rigs. The project would fill 22 acres of water with one million cubic yards of rock and dirt. 1982 – CBI has a bill introduced in the state legislature exempting their property at Cherry Point from the Shoreline Management Act [Washington state voters passed Shoreline Management Act in 1972]. It is passed by the legislature, but is vetoed by governor John Spellman. 1983 – Kiewit Construction Company proposes the upland fabrication of offshore oil and gas drilling platforms. 1984 – Washington State DOE and Fisheries deny permits to Kiewit. What stood out to me in looking at the timeline is that Cherry Point has been under assault pretty much every decade since 1954, by industries wanting to use Cherry Point’s land and waters. I am now starting to realize that the 2008-2009 timing of SSA/PIT’s announcing its embarking on the GPT project was strategic in that the Cherry Point Aquatic Reserve Plan was due for its 2010 (at least every 10 years after the adoption of the Plan in 2000) review and update to ensure the currency of scientific, management and site-specific information as mandated in the Plan. July 5, 2007 was the date Goldman Sachs invested 49% in Carrix/SSA Marine so that is what I imagine got the ball rolling on GPT. August 2007 is when PIT assumed the contract of Chevron (former Cherry Point industry) with the PUD for industrial water. The original April 1970 agreement with Chevron and the PUD was assigned by Chevron to PIT on August 7, 2007. November 2006 is when I believe Craig Cole’s Brown & Cole grocery stores declared bankruptcy, so that made perfect timing for SSA/PIT to ask him to join their GPT efforts in selling their coal scheme to our county. I wonder when Cole first started doing work for SSA/PIT earning his first paycheck for his work on SSA/PIT’s behalf? SSA/PIT/Cole were doing all they could to affect the Cherry Point Aquatic Reserve Plan Draft by lobbying/pressuring WA state DNR Lands Commissioner Goldmark. Cole managed to get local elected officials, former elected officials, and other GPT supporters to sign a June 2010 letter to Goldmark lobbying for changes to the language in that Plan Draft. I’m glad they didn’t get you to sign that letter. I admire and appreciate your taking a stand in opposition to GPT, as Mayor in 2011. I wish you were still Mayor of Bellingham, and I’m sure many others share my sentiments on that. Your thinking that Cole’s perspective has not changed as much as some may think is probably a good assessment. Thanks for that timeline; it mirrors my memory, which is reassuring, lol. As I recall, Craig joined the Council in 2002, having been elected in 2001, and was a strong voice for both the original CBI proposal and its Kiewit successor. Governor Spellman was the right person in office at the right time, fortunately. He not only got to deal with this issue, but also the meltdown of the WPPSS nuclear proposal. Too liberal for the GOP, and not willing to go along with labor on jobs over every other consideration, he lost his reelection, but did a good job overall, hamstrung more by the troglodytes (his term, which I thought was perfect) in the GOP caucus than the Dems in moving a pretty progressive agenda forward. As far as the Goldmark letter, Craig and his allies were certainly *trying* to get me to go along. They might have succeeded, too, were it not for some folks who opened my eyes to the reality of the situation. I was fortunate in having a number of folks who would tell me the truth, even when it went against what I thought, or even stated publicly, at the time. And I was always open to more opinions, which I think was probably my greatest asset in office. In this instance, it was Bob Ferris, who Craig succeeded in running out of town, and Jack Delay, who is an incredibly smart and dedicated community asset, even though most folks haven;t a clue who he is. Going over the facts with them (separately; not sure what if any relationship they had with each other) gave me clarity regarding what was really going on, and what the PIT proposal would mean to our community, and thus the backbone to decline to sign. I have no doubt that that decision was a major motivator in getting folks who had been agnostic on my reelection to become enthusiastic supporters of ‘anyone but Dan,’ actively seeking out someone who could defeat me. There was only one person, and she played the coal issue coyly–and still does. While other communities have their Mayors standing up strongly against what is clearly harmful to most communities along the BNSF route, the city most impacted–Bellingham–is largely silent, though Michael Lilliquist has prodded the Council into taking a few positive steps. Really though, the strength of the opposition, especially locally, rests on folks such as you who are tenacious in exposing the ugly truths behind the slick PR veneer presented through Op Eds and expensive mailers, and through the tribes, who are saving us from ourselves. Dena, I expect there aren’t a lot of folks at the Herald that were around back then to remember. They likely relied on Craig’s self-provided bio (that’s pretty standard for this sort of op-ed), and the facts he presented for the bio are true, if incomplete. Yes, I thought it was probably info that Cole provided them with. I am sure he would want to be marketing himself in a favorable light with respect to this article. From all the other things I witnessed that he did in his Op-Ed, I can see it’s all smoke and mirrors with Craig Cole. Oh you mean Kelli “I will support a coal terminal if you call it a grain terminal” Linville. Dena, Congratulations on your wonderful new blog. I look forward to continued good reading after this excellent piece by Sandy Robson. Craig was chair of the Natural Heritage Task Force, a group of distinguished public servants, that made use of dozens of specialists as advisors in producing the report. As one of the contributing authors of the report, I recall the arduous but productive process was akin to a jury: many perspectives and interests working to find a mutually agreeable solution. Washington Appellate Judge Mary Kay Becker was on the task force, and was the reason I became involved. Your readers might enjoy her 1974 novel Superspill, about an oil tanker grounding in the San Juan Islands.